The bridesmaids, being bridesmaids, got a lot of attention at the wedding, not to mention handmade shawls. But my mom did a ton of work too, so when it became apparent that I would have enough yarn but not enough time or emotional energy to make her a shawl too, I went for plan B: A cape in big bulky yarn. 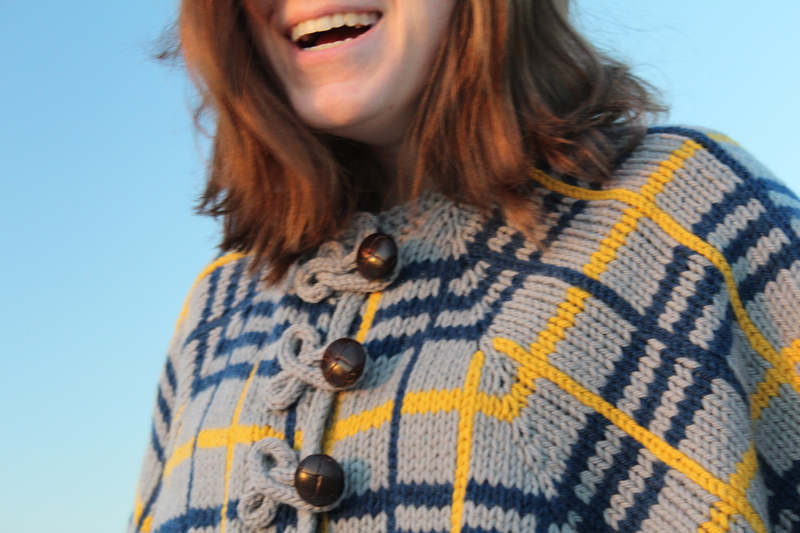 This is the Plaidscape from Holla Knits Fall 2013 collection. When the collection came out and I saw this cape, I thought immediately of Mummy. It just took me a while to go from inspiration to execution. When you print out this pattern, it looks a little scary: there are eight pages, with a page and a half devoted to knitted on edges and finishing–eek! 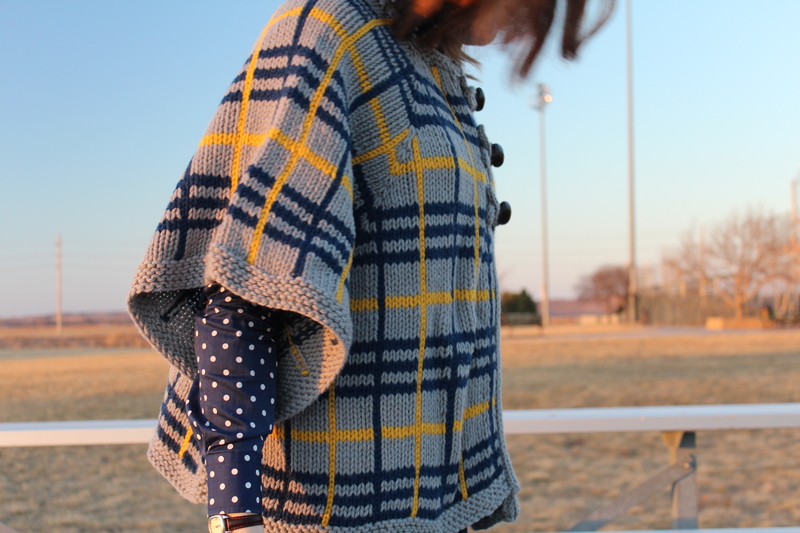 Once I got knitting, however, I realized it was not scary at all. The raglan body flew off the needles, the rounded hems were just a few short rows, and the vertical stripes were just slip stitch crochet. I had a lot of ends to weave in when I was done, but with my Knit Night buddies cheering me on, even that wasn’t too bad. Plied bulky yarn is hard to find, but I wanted something hard-wearing, so I chose Knit Picks Wool of the Andes Bulky. This line comes in crayon-solid colors, so the color scheme was a little more varsity than the edgy grellow look I originally intended. 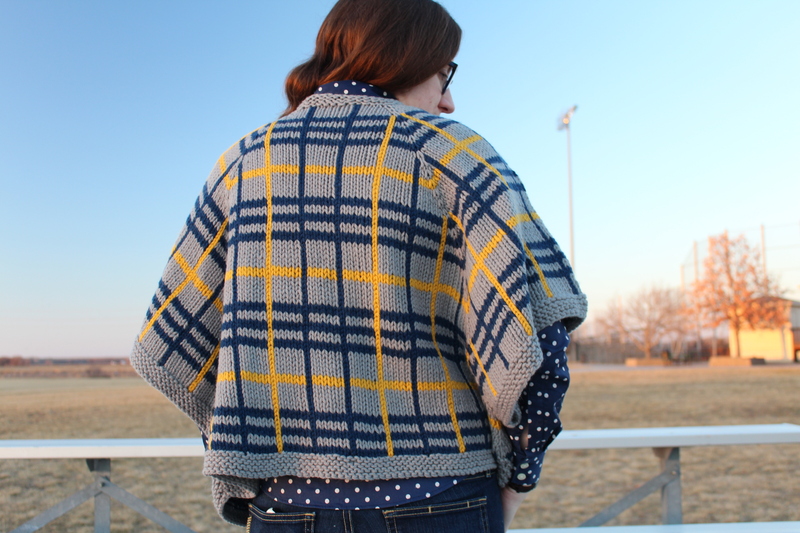 As I gave the Plaidscape a test drive out on the bleachers of a nearby school (do not be deceived by that warm sunset: it was pretty darn cold out), I remembered that all garments look different when being worn than on the needles. Plaidscape was not exception: out in the wild, it looked great. My mind started wandering to color schemes that might go with my own wardrobe. Browns and purples? Black, gray, and red? Not to worry: I got that cape packed off to Arizona, and Mummy loves it. Thanks again Mummy! Lucky bridesmaids! And, lucky mom! The cape looks fantastic. That’s awesome! I’ve been eying up a stylish cape, myself. Love the plaid. Thanks! 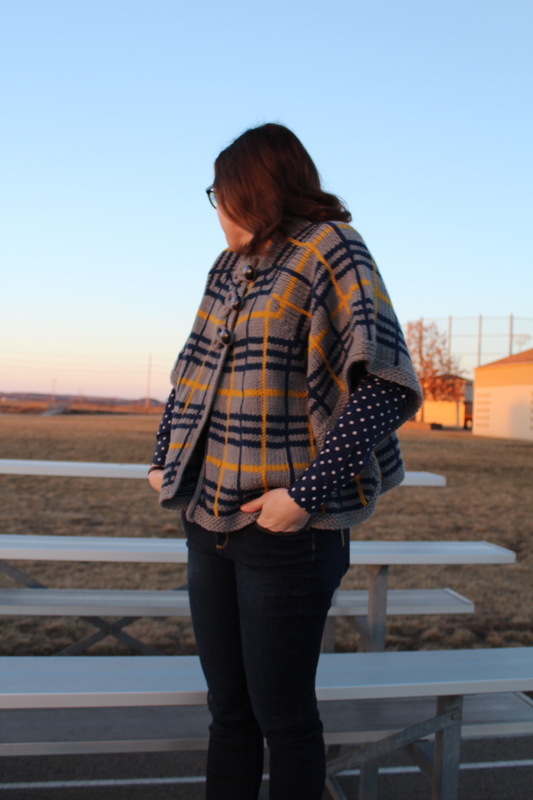 I totally recommend this pattern, although if you’re into stripes or texture, Holla Knits has published two other cape patterns too!